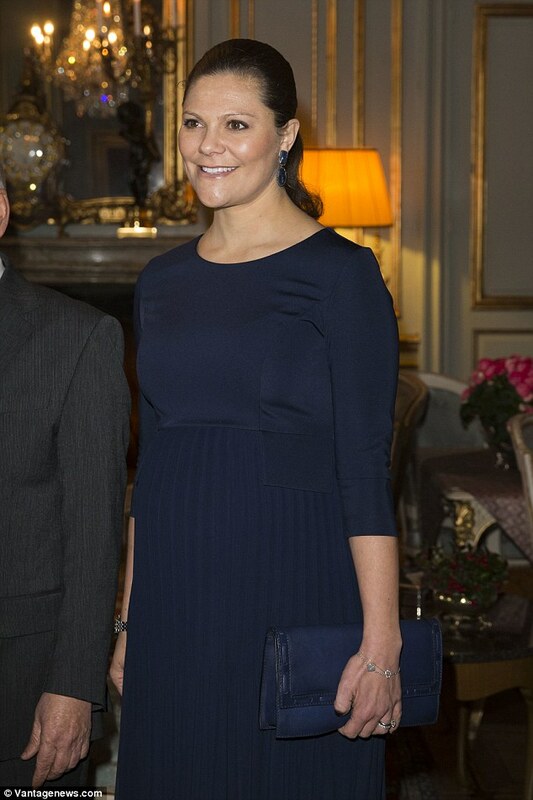 Crown Princess Victoria of Sweden showed off her growing baby bump today in an elegant midnight blue dress. 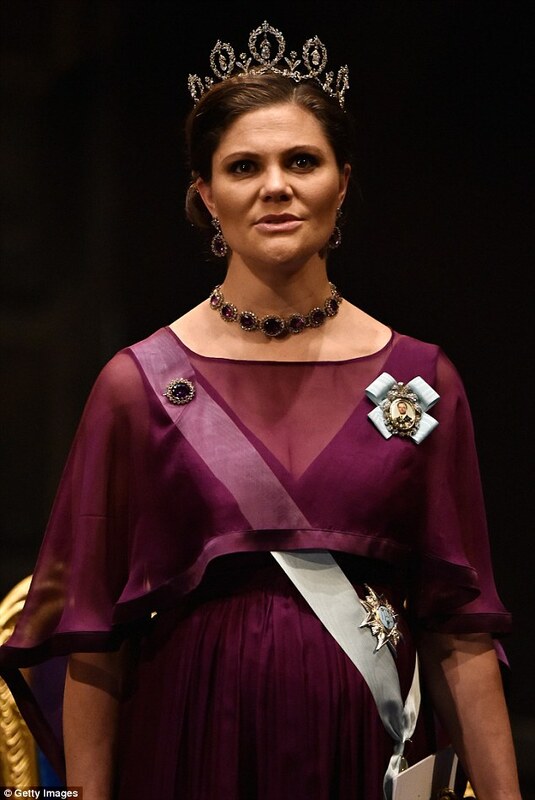 The 38-year-old heir to the throne, who is expecting her second child with husband Prince Daniel, 41, looked radiant as she welcomed recipients of the Nobel Peace Prize to a low-key ceremony at the palace in Stockholm, Sweden. 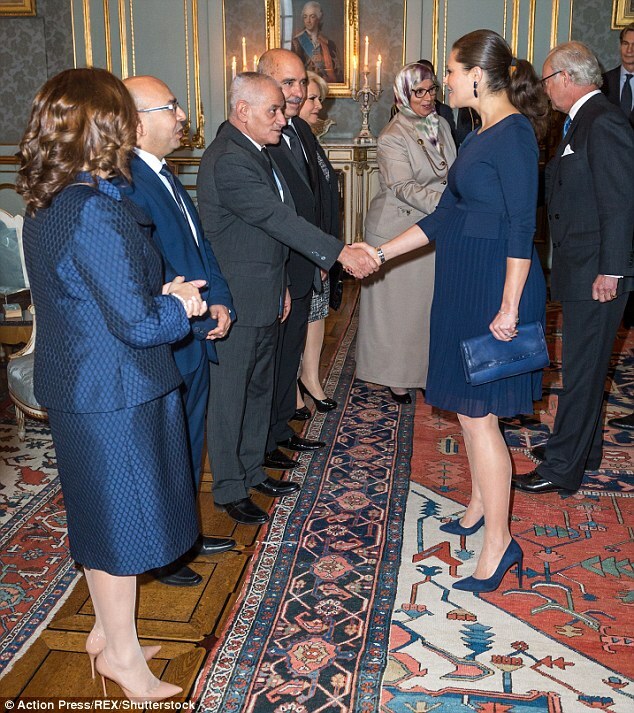 Accompanied by her father, King Carl XVI Gustaf, the expectant mother smiled broadly as she chatted to the winners of the prestigious award, The Tunisian National Dialog Quartet. The Princess, who wore her dark hair in a simple ponytail, opted for a fitted Empire Line dress from Seraphine, £99, with a pleated overlay that cascaded over her bump – the same dress the Duchess of Cambridge wore almost exactly a year ago to attend a meeting with the 1851 Trust in London. Victoria teamed it with a matching clutch and mid-height stilettos, along with some jewel-encrusted earrings; and opted for a paired-down make-up look. The news that the Crown Princess was expecting her second child with Prince Daniel, a former personal trainer, was announced in a statement released by the Swedish Royal Court on Friday September 4, and confirmed by the princess herself over that weekend. 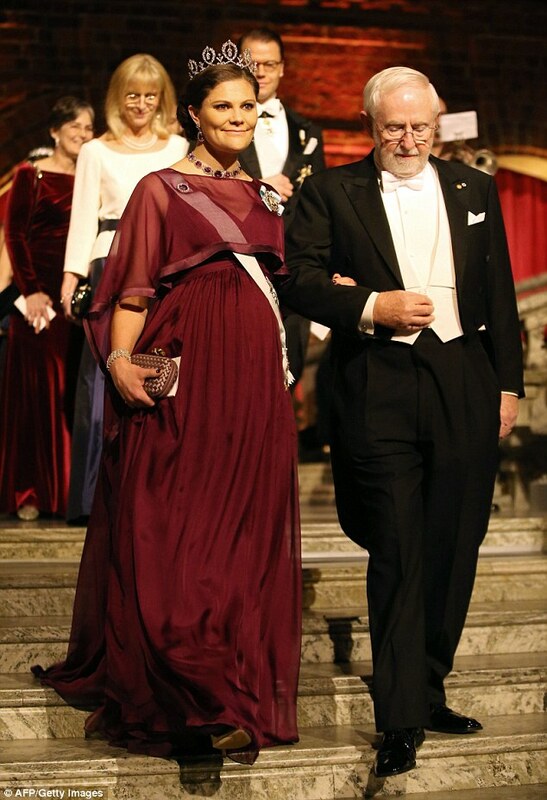 When the baby is born in March 2016, the new arrival will become the third-in-line to the Swedish throne behind his or her mother and older sister Princess Estelle, Duchess of Östergötland, three. 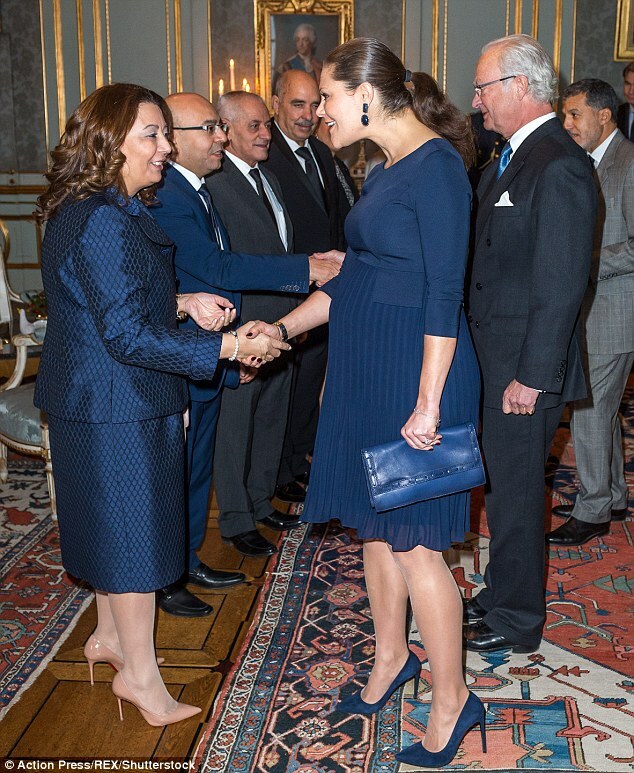 Following the lead of our own reigning fashionista, Princess Victoria of Sweden opted for a navy blue pleated dress which the Duchess of Cambridge previously wore during her second pregnancy. 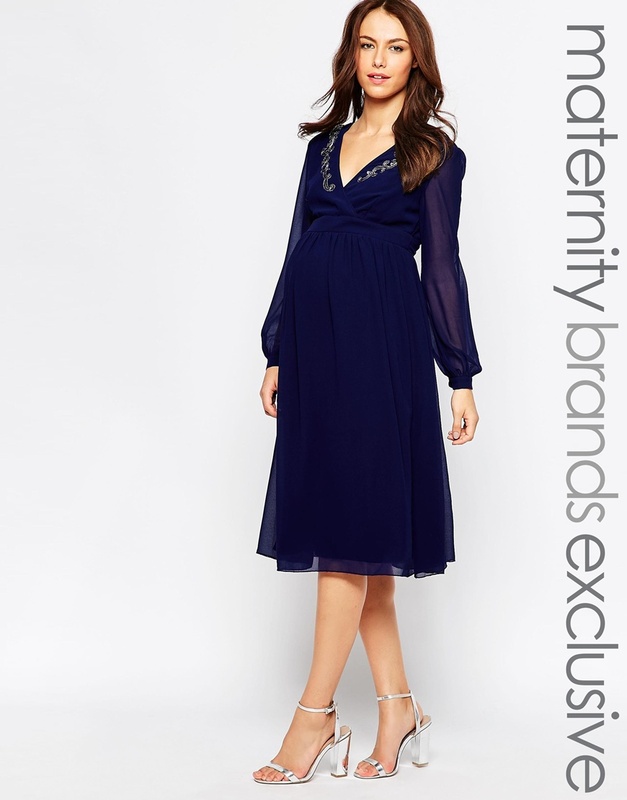 The dress in question is from British maternity wear label Seraphine, which was a favourite of Kate’s through both her pregnancies. If you’re looking for super stylish, high quality maternity wear, Seraphine should be your go-to designer! And we reckon this chic navy number would be perfect for the party season and beyond! Simply style with metallic accessories for a festive twist, then switch for coordinating suede pumps and a sharp blazer for office appropriate vibes! Click right to get this exact dress now, or for more choice check out our full edit below, including high street picks at Asos and Little Mistress, as well as another designer option from Isabella Oliver- a celeb fave! 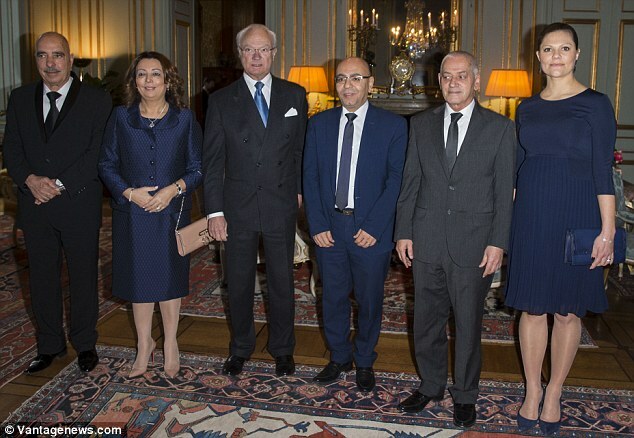 Princess Victoria and her father were the only members of the royal family present to receive the four winners; Hassine Abassi, Mohammed Fadhel Mahfoudh, Abedssatar Ben Moussa and Guided Bouchamaoui. The esteemed honour was awarded to them based on their help in preventing the Tunisian Jasmine revolution in 2010 from spiralling into chaos as it did with the Arab spring. 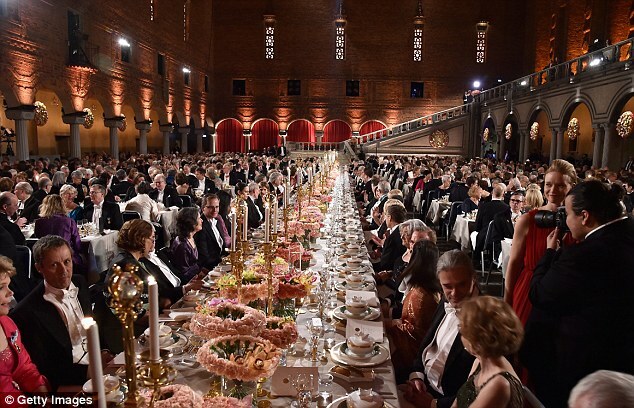 Today’s event follows The Nobel Prize Banquet held at Stockholm’s City Hall last Thursday, where the richly attired royals hosted the world’s biggest brains and brightest talent. The women of Sweden’s royal family pulled out all the stops – along with the family jewels – to look their best for the splendid occasion; Princess Victoria, Princess Madeleine, 33, and their sister-in-law Princess Sofia, 30, dusting off the Bernadottes’ most eye-catching tiaras to wear with their floor-length evening gowns. The ceremony was decked out for the occasion with 20,000 white, yellow and orange flowers which were donated by the Italian city of San Remo, where Swedish scientist and prize creator Alfred Nobel died on December 10, 1896. 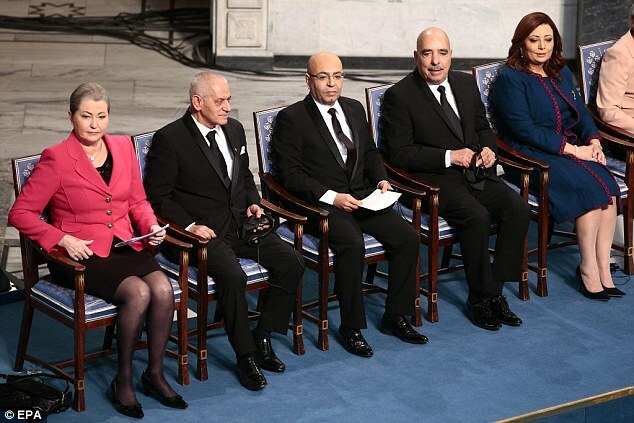 The ten laureates received their Nobel diplomas and gold medals from the hands of King Carl XVI Gustaf, and took place in front of 1,600 specially-invited guests at Stockholm’s Concert Hall. Mr Abassi, head of the Tunisian General Labour Union, and one of the winning quartet who visited the palace today, gave an impassioned speech. ‘Today we are most in need of making the fight against terrorism an absolute priority, which means perseverance on coordination and cooperation between all nations to drain its resources,’ Mr Abassi said. As well as maintaining the war on terrorism, the pro-democracy group called for Palestinians to be given the right to self-determination.